The Verdict: When I looked at the menu I found the entry for the chicken parmigiana more interesting than usual as it referenced slaw as the salad portion of the meal. The last time a Parma came out with slaw it very nearly took the top spot in this quest. Unfortunately when this Parma was delivered with a garden salad where the slaw ought to have been, I sensed disappointment on the horizon which manifested itself in another very dry piece of chicken! Chicken: My first impression of the chicken on this dish was positive: it looked great! Then I tried to cut my knife into it and immediately felt that twang of impending doom: I just knew it was going to be too dry because I could not cut it easily. So it proved (even allowing for a slightly blunt knife) as from the first bite to last this chicken piece was dry and overcooked. Sauce: The dryness of the chicken was counteracted by the, again, bountiful supply of Napoli sauce (according to the menu). It was rich, tasty and everywhere it needed to be on the chicken. Ham: I have been disappointed by the ham served in the past, particularly with the larger size chicken pieces, but the Brunswick Hotel Parma possessed a large slice of ham which covered a significant portion of the chicken piece. It complimented the sauce and cheese well. Cheese: I have rarely seen so much cheese on a chicken parmigiana. So much so the melted crust of it seemed to encase the chicken and, in places, had melted over the sides. It was perfectly melted and matched the ham and sauce perfectly. Side Dishes: I have commented in the Verdict that the salad served was not as ordered. This issue was compounded by the salad not being very good. When will kitchens learn that the salad is not an afterthought? On the other hand the chips on this meal were close to the best I have had on this quest: perfectly cooked, crispy and golden brown I could find no fault in them. Presentation: The Brunswick Hotel absolutely nailed the presentation here. A large square plate meant no part of the dish was sitting on another part. This is what I would like to see every week! The venue: The Brunswick Hotel is on Brunswick St and borders the Valley and New Farm. It has clearly gone through a refit in recent years and, frankly, is quiet impressive inside. Even more impressive is the massive car park out the back which makes this pub a rare gem in the oft park less and cramped Valley hotel precinct. 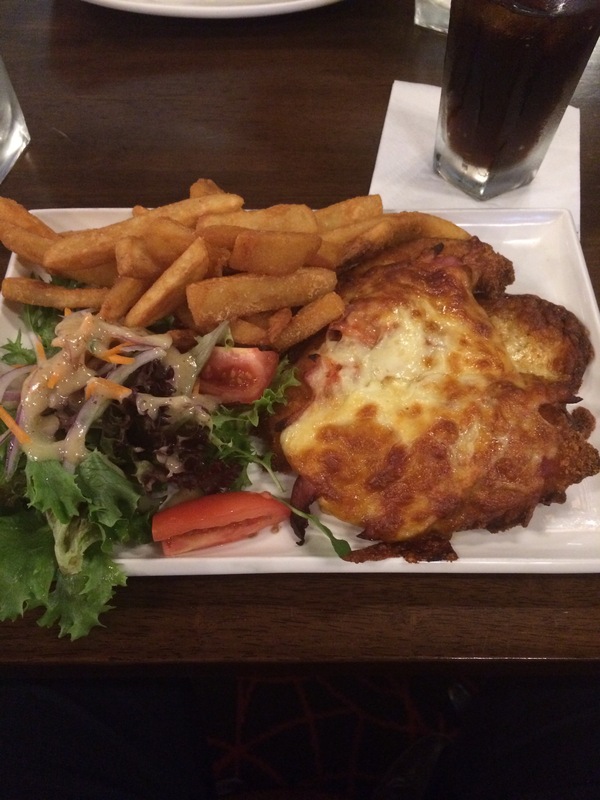 My Parma cost $21 and was great value for money. I should note here that Wednesday night is $15 Parma night at the Brunswick however I ordered the Parma off the menu and not the special. The Final Word: This Parma had some really very good elements to it. If the chicken and salad had have been to the standard of the rest of the dish this one would have been a contender for the Robert Parma. Sadly, not getting the meal as described on the menu set the tone for the meal. However, I could have forgiven that if the chicken and salad were, for want of a better term, better. This entry was posted in Uncategorized and tagged Brisbane, brisbane eats, brisbane food, brunswick hotel, chicken, chicken parmigiana, Parma. Bookmark the permalink. 2 Responses to Parma Number 18: The Brunswick Hotel … That’s not what I ordered! Hey mate im a brissy chef and ive been following posts. I just wanted to point out some missing bits in your review. Those chips have been cooked and refried. They form that white residule marks on them because they have been salted and then dipped again. They are obvious as hell you dont get chips like that crispy without refrying them at least twice. I dont know how u can say the presentation of this dish is good when it actually looks like sh*t. Refried chips, parmy way overcooked and a side salad with no topping garnish let alone the missing slaw. Thanks for the feedback mate. I am not a chef. I am reviewing these parmas as a rank amateur based on what I like and I perceive as a punter eating them. On the chips: they were brilliant. I am not bothered by the process that got them to taste the way they did.